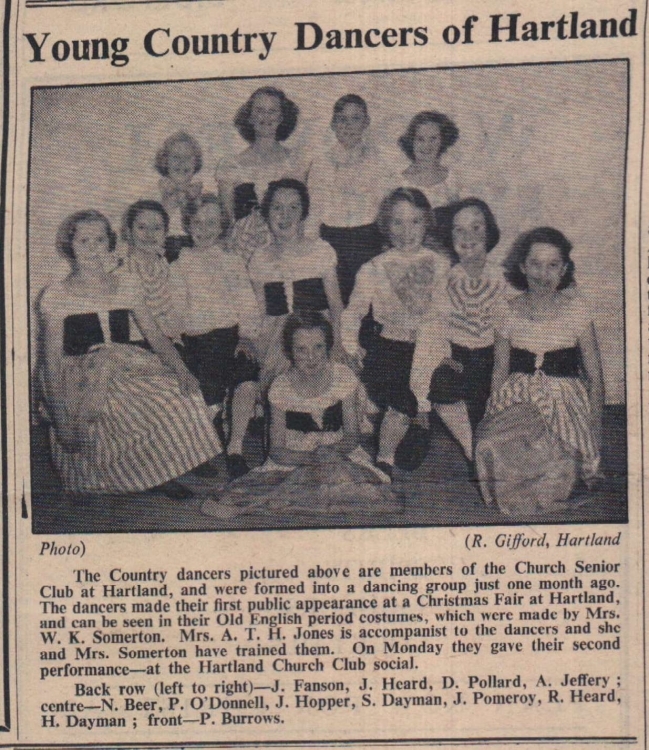 The Country dancers pictured are members of the Church Senior Club at Hartland, and were formed into a dancing group just one month ago. The dancers made their first public appearance at a Christmas Fair at Hartland, and can be seen in their Old English period costumes made by Mrs W K Somerton. Mrs A T H Jones is accompanist. On Monday they gave their second performance at the Hartland Church Club social. In the picture are - J Fanson, J Heard, D Pollard, A Jeffery, N Beer, P O'Donnell, J Hopper, S Dayman, J Pomeroy, R Heard, H Dayman, P Burrows.